There's a wide range of NAS options available now. There's Atom-based devices like the four bay Synology DS414; there's PowerPC based devices like the two bay Thecus N2310; and there's Intel-based devices like the five bay Thecus N5550. While the number of drives the device can use is definitely an important factor, it's arguably more important to determine what you want your NAS to do. If you want to simply serve up files, you'll probably want to purchase something different than if you want to connect it to your TV or if you want to run custom applications such as web and database servers. It's the people who want a box to do a little of everything, but don't want to run their own traditional server, that QNAP is targeting with their newest device, the TS-451. Running QTS 4.1.0 as the operating system, the Intel-based box has a streamlined interface that can share files with you anywhere on the Internet, like most other NAS devices, can easily run applications to extend the functionality with a seamless interface like Synology does, but ups the ante by adding something other NAS devices don't: Virtuazliation. 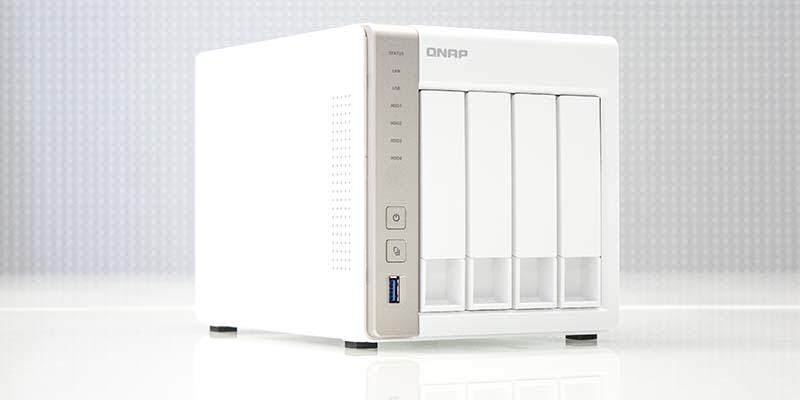 Yes, the QNAP TS-451 lets you run multiple virtual hosts on the same hardware that's sharing files within your environment. In its standard configuration, the TS-451 sports an Intel Celeron 2.4GHz processor with 1GB of DDR3 RAM. Unlike most NAS boxes, the TS-451 can be field upgraded, supporting up to 8GB of RAM, and while it's not easy to get to the memory slots, QNAP provides great documentation on their site on how to do it. Our review model came with 4GB of RAM.